The Fluke 1587 MDT advanced insulation and motor drive troubleshooting kit is designed for troubleshooting and preventive maintenance applications including three-phase motors, cables, switch gear, and in applications where testing is required without the need to break the circuit. 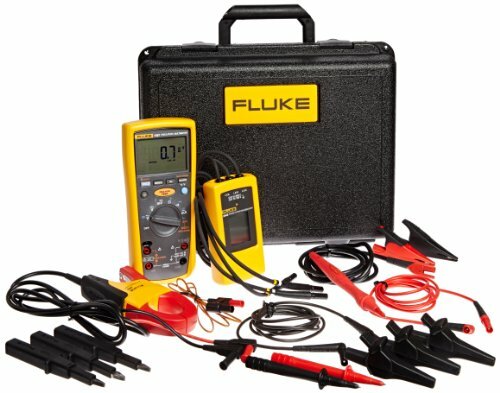 The kit includes the Fluke 1587 digital insulation multimeter, Fluke i400 current clamp, and Fluke 9040 phase rotation indicator. The Fluke 1587 digital insulation multimeter (also known as a multitester) is a true RMS, auto- and manual-ranging meter insulation resistance, current, voltage, and resistance for testing line insulation in telecommunications applications. The insulation test voltage settings of 50V, 100V measure resistance from 0.01 to 100 megohms. The meter also measures capacitance, frequency, and resistance. Temperature is measured using a K-type thermocouple (included). A diode test detects correct functioning of a circuit's diodes. A low-pass filter provides accurate AC voltage and AC frequency measurements on inverters and variable-frequency motor drives by blocking unwanted voltages. Live circuit detection increases user safety by preventing insulation tests when voltages exceed 30V, and auto-discharge of capacitive voltage increases user protection. An audible continuity sensor confirms a circuit conducts electricity. The LCD is backlit for readability in low light. A hold function freezes the reading on the display. An alarm sounds when the test leads are connected to the wrong jack for the measurement being taken. The unit automatically turns off after 20 minutes of nonuse to conserve battery life or can be disabled for extended readings, and a low-battery indicator signals when the meter's batteries need to be replaced. The meter included a set of detachable test leads, a remote probe, alligator clips, a hard case, and instructions. This true RMS (root mean square) insulation multimeter provides accurate readings when measuring linear loads, such as standard induction motors and incandescent lights, where the current or voltage has an undistorted waveform, or nonlinear loads, such as electronic devices or motors, where the current or voltage has a distorted waveform. When turned on, the meter is in auto-ranging mode and automatically selects the correct operating range for the property being measured. It can be switched to manual-ranging mode, which allows the operator to choose the appropriate operating range. The display has a 6,000-count resolution, meaning it can display up to 5,999 units (3-3/4 digits) before the operating range needs to be changed. It meets International Electrotechnical Commission (IEC) safety standard 61010 and is certified Category III installations up to 1000V, which covers items used with enclosed building circuit installations (such as service panel parts, branch circuits, and fixed installations that are connected directly to a building's AC power supply), Category IV installations up to 600V, which covers equipment at the origin of the installation (such as electricity meters and primary over-current protection equipment), and Pollution Degree 2 for indoor use. The Fluke i400 current clamp is a single-range 400-amp AC current clamp designed to extend the measuring capability of AC current meters to 400 amp. It has a 1 to 400 amp continuous current range and outputs 1 milliamp/amp. The clamp uses 4mm safety shrouded banana plugs. It meets International Electrotechnical Commission (IEC) safety standard 61010 and is certified Category III installations up to 1000V, which covers items used with enclosed building circuit installations (such as service panel parts, branch circuits, and fixed installations that are connected directly to a building's AC power supply), Category IV installations up to 600V, which covers equipment at the origin of the installation (such as electricity meters and primary over-current protection equipment), and Pollution Degree 2 for indoor use. The Fluke 9040 phase rotation indicator is designed to measure phase rotation where three-phase supplies are used to feed motors, drives, and electrical systems in commercial and industrial applications. The LCD displays field rotation and direction to determine correct connections. The indicator has a voltage range of 40 to 700V, a frequency range of 5Hz to 20kHz, and a continuous operating timer. The included test probes have a variable clamping range for safe contact. It meets International Electrotechnical Commission (IEC) safety standard 61010 and is certified Category III installations up to 600V, which covers items used with enclosed building circuit installations (such as service panel parts, branch circuits, and fixed installations that are connected directly to a building's AC power supply), Category IV installations up to 300V, which covers equipment at the origin of the installation (such as electricity meters and primary over-current protection equipment), and Pollution Degree 2 for indoor use.